This Poggenpohl custom kitchen by Designs Unlimited is the Michigan regional winner in the 2010-2012 Sub-Zero and Wolf Kitchen Design Contest. 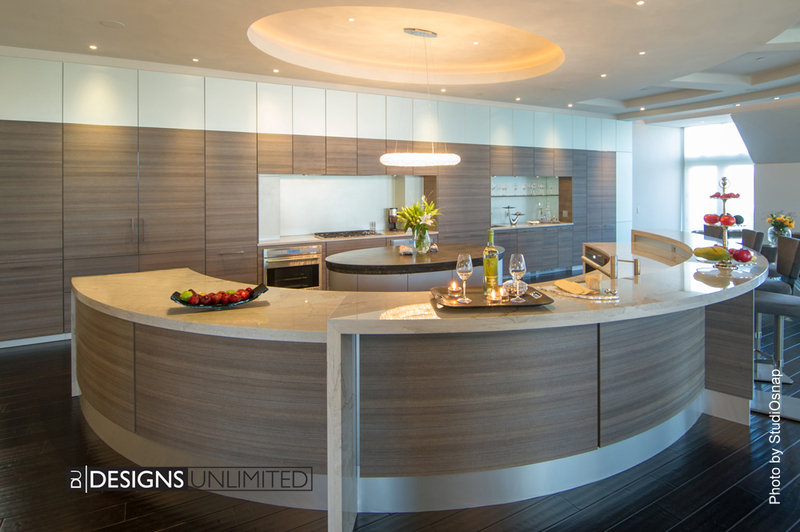 Earlier this week, Designs Unlimited had the distinct privilege of being recognized as the Michigan regional winner in the 2010-2012 Sub-Zero and Wolf Kitchen Design Contest for a contemporary luxury Poggenpohl kitchen we designed and installed in Birmingham, Mich. The scope of the project and the client’s objectives made this kitchen a dream opportunity. We started with a blank canvas and a few ideas sketched on a napkin. Through close collaboration with the client and our project partners, we were able to create a functional masterpiece. The luxury condominium would serve as both a comfortable residence and a stylish space for entertaining guests. Form and function were inseparable. The client wanted an extraordinary custom kitchen that would blend seamlessly into the architecture of the space while offering convenient functionality for everyday use. Teamwork was essential. The need for uncompromising quality and a fully integrated design made Sub-Zero and Wolf the obvious choice for appliances. Working closely with Trevarrow in Auburn Hills, Mich., we assisted the client in choosing high-performance systems for cooking and food storage. Two 700 Series Sub-Zero integrated refrigerator/freezers were stylishly concealed by the clean lines of the main wall. The gleaming Wolf cooktop was framed by two single ovens to provide ample cooking space, and an integrated Sub-Zero beverage center in the bar area would allow guests to help themselves without entering the cooking area. Poggenpohl teak lava décor provided the ideal finish for the unique and sensuous design. Appliances and doorways blend seamlessly into the wall of custom cabinetry. Creating the final design required meticulous attention to detail. The curved, free-floating island had to match the flow of the condominium’s serpentine wall and gracefully conceal a dishwasher and Wolf microwave drawer. Entryways to the laundry room and exercise room adjacent to the kitchen needed to completely disappear for entertaining behind doors that blended seamlessly into the wall of custom cabinetry. These goals were achieved through intimate collaboration with the builder, TSA, headquartered in Bloomfield Hills, Mich. At every stage of the project, TSA worked closely with us to verify each aspect of the design and devise creative solutions to complex challenges. PMP Marble & Granite, based in Troy, Mich., provided the finishing touches with elegant quartzite countertops, flawlessly fabricated and skillfully installed. Matching the curved shape of the island with natural materials was far from easy, but PMP rose to the challenge and exceeded the client’s expectations. The final outcome of this project was a result of close collaboration and teamwork, every step of the way. 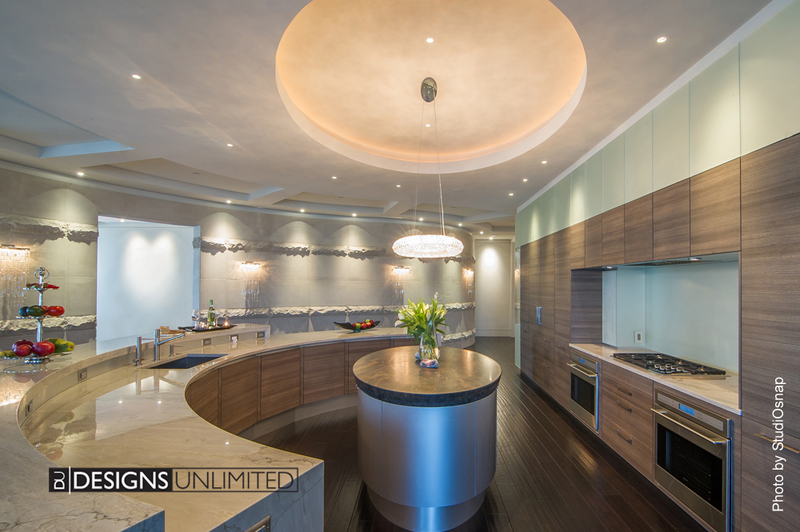 Designs Unlimited is honored to be selected as a regional winner for the Sub-Zero and Wolf Kitchen Design Contest, and we are grateful to our network of talented partners and associates who are essential to making our innovative designs a reality.